Time to usher in Chinese New Year with Sam Hui's classic tribute to the God of Wealth from late 1970's Hong Kong! 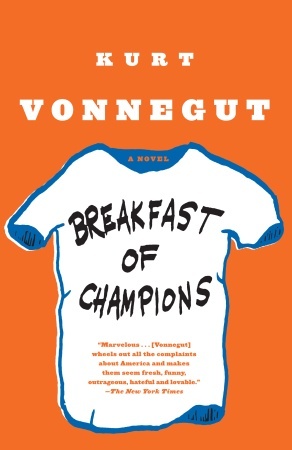 Thanks to A. for sharing the book Breakfast of Champions by Kurt Vonnegut, first published in the U.S. by Delacorte Press, 1973. Following is an excerpt from the novel. 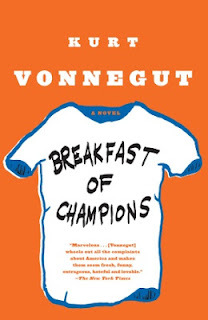 A lot of the nonsense was the innocent result of playfulness on the part of the founding fathers of the nation of Dwayne Hoover and Kilgore Trout. The founders were aristocrats, and they wished to show off their useless education, which consisted of the study of hocus-pocus from ancient times. They were bum poets as well. The teachers told the children that this was when their continent was discovered by human beings. Actually, millions of human beings were already living full and imaginative lives on the continent in 1492. That was simply the year in which sea pirates began to cheat and rob and kill them. ... Actually, the sea pirates who had the most to do with the creation of the new government owned human slaves. They used human beings for machinery, and, even after slavery was eliminated, because it was so embarrassing, they and their descendants continued to think of ordinary human beings as machines. Here is how the pirates were able to take whatever they wanted from anybody else: they had the best boats in the world and they were meaner than anybody else, and they had gunpowder, which was a mixture of potassium nitrate, charcoal, and sulphur. They touched this seemingly listless powder with fire, and it turned violently into gas. This gas blew projectiles out of metal tubes at terrific velocities. The projectiles cut through meat and bone very easily; so the pirates could wreck the wiring or the bellows or the plumbing of a stubborn human being, even when he was far, far away. The chief weapon of the sea pirates, however, was their capacity to astonish. Nobody else could believe, until it was too late, how heartless and greedy they were.